Mark Salzman received critical acclaim for Iron & Silk, his personal account of two years spent in China. In Lying Awake, he creates a fascinating spiritual landscape that lies behind the walls of a monastery. Readers around the world praise the beauty and originality of this novel. Sister John has devoted her life to serving God. For almost 30 years she has lived in a Carmelite monastery near Los Angeles. There, she experiences religious visions of such intensity that she is revered by the other nuns. But these visions also bring on excruciating headaches. When she is offered an operation that may stop the pain, she realizes that it may also stop the visions. Now Sister John wonders how this change will affect her faith. 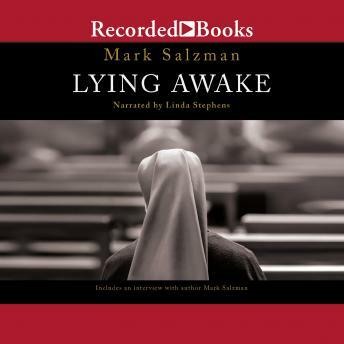 Lying Awake is an eloquent examination of religious experience that transcends the boundaries of church and doctrine. Narrator Linda Stephens perfectly conveys Sister John's thoughts, feelings, and visions.